Catharine Pendrel of Team LUNA Chix will be the guest of honor for the the National Interscholastic Cycling Association's annual awards ride and banquet, January 24th, 2015. Robin Farina, president of the Women's Cycling Association and 2011 National Road Race Champion, will serve as the master of ceremonies for the banquet. The NICA Awards provide an insight to the tremendous diversity of people and roles involved in the high school cycling movement. Among those honored on this night are student-athletes, coaches, volunteers and partners who have made outstanding contributions toward the expansion of interscholastic cycling across the United States. Pendrel states: "I am super excited to be a part of the NICA Annual Awards! NICA is an amazing program that I wish existed when I was a teenager...and in Canada! There is nothing that inspires me more than seeing young people having fun on bikes. Cycling has given me so much as a person. It has encouraged me to really challenge myself and discover my potential, not only as an athlete, but as a mentor. For this I am ever grateful. I look forward to meeting the next generation of cyclists!" 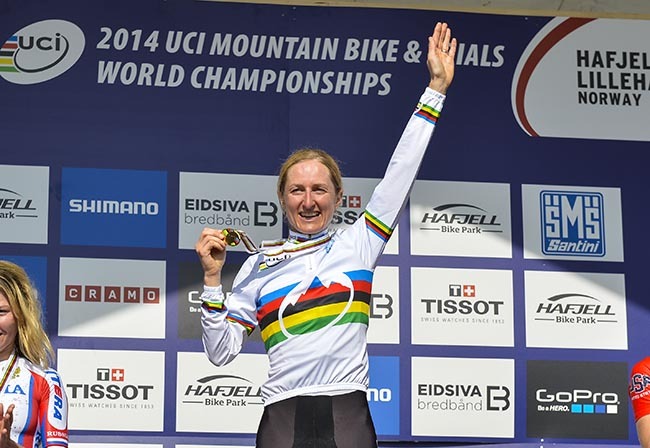 Catharine Pendrel, from Kamloops, BC, Canada, is a two-time World Champion and Canadian Olympian in mountain biking. She got her start in sports with horses, competing in events until age 16 when her brother introduced her to mountain biking and the amazing community of people riding bikes. While completing a University Degree in British Columbia, a fate encounter led her to find her first coach, who would then lead her to two Olympics. Since that day in 2002, Catharine has been dedicated to the idea that better is always possible. Austin McInerny, NICA's executive director, said, "We are thrilled to have Catharine as our guest host this year! The NICA Annual Awards showcases individuals who have demonstrated outstanding characteristics ranging from pure athleticism to incredible courage and generosity. Catharine embodies these traits and serves as an outstanding role model for the young student-athletes participating in NICA's ever-expanding programs across the country." In addition to recognizing many outstanding individuals, the awards event is an opportunity to summarize NICA's successes over the past five years and to detail efforts to strengthen opportunities for youth cycling, particularly young women, across the country. Austin explained "Working with the Women's Cycling Association, NICA is focusing efforts in 2015 to help inspire, motivate, equip and support young women in order to help them discover the benefits of cycling." NICA will present awards in eleven categories to thirteen outstanding individuals across NICA's leagues in Arizona, Colorado, Georgia, Minnesota, New York, Northern California, Southern California, Tennessee, Texas and Utah, Wisconsin, Georgia and Virginia. Specialized Student-Athlete Leadership Award - The Student-Athlete Leadership Award honors student-athletes who have demonstrated outstanding leadership, sportsmanship, academic performance and volunteerism in their team, school and community. Trek All Star Student-Athlete Award - The All Star Student-Athlete Award recognizes student-athletes for their outstanding competitive achievements and potential for future success in competitive cycling. Camelbak Distinguished Alumni Award - The Distinguished Alumni Award recognizes a student-athlete who carries on the spirit of high school cycling beyond their high school years. GU Energy Extraordinary Courage Award - The Extraordinary Courage Award recognizes student-athletes who have persevered through challenging circumstances, overcome adversity to develop and excel as an individual and role-model to other students. International Mountain Bike Association Teen Trail Corps Award - The Teen Trail Corps Award recognizes a student-athlete who has demonstrated respect, empathy and compassion towards other trail users by working both on and off the bike to build awareness and care for trails in their community. SRAM Coach of the Year Award - The Coach of the Year Award acknowledges a head coach whose qualities as a leader and motivator embody NICA's mission to provide student-athletes with the coaching and camaraderie to help them achieve both competitive and non-competitive goals in a safe and enjoyable manner. Clif Bar and Company Volunteer Service Award - The Volunteer Service Award honors an exceptional volunteer whose dedication of time, expertise and enthusiasm goes above and beyond to make a difference in the organization. Quality Bicycle Products Community Impact Award - The Community Impact Award honors an individual whose dedication to high school mountain biking has resulted in positive impacts on youth, the community and the organization. This individual is an outstanding representative of the organization both internally and externally. Primal Wear Race Production Partner Award - The Race Production Partner Award acknowledges an individual whose outstanding partnership role in race productions is key to the success of a league's race event production. Easton Foundations League Founder Award - The League Founder Award recognizes an individual's commitment, enthusiasm and perseverance in launching a new NICA league. NICA Legacy Award - The Legacy Award honors an individual for their tremendous philanthropic support of NICA and NICA leagues. Recipients of this award are individuals who understand the importance of empowering youth through sport and who have put their energies behind efforts that demonstrate and exemplify the traits that they themselves possessed and utilized to help them achieve success. Online registration for the NICA Annual Awards Ride & Banquet is now open. In addition to the awards dinner, a benefit ride with Catharine Pendrel offers ticket-holders an exhilarating adventure on the flowy singletrack riding of the renowned China Camp. The ride includes Clif Bar and GU Energy nutrition products, a catered trailside lunch and the opportunity to ride with one of the legends of the sport. 2014 NICA Annual Awards and Benefit Ride tickets are on sale now Here. Founded in 2009 as a 501(c)3 non-profit, the National Interscholastic Cycling Association (NICA) develops interscholastic mountain biking programs for student-athletes and coaches across the United States. NICA provides leadership, services and governance for local leagues to produce quality mountain bike events, and supports every student-athlete in the development of strong body, strong mind and strong character through their efforts on the bike. As of winter 2014, NICA is supporting over 1900 coaches and 5,000 student-athletes from over 400 high schools in thirteen (and growing) separate leagues.